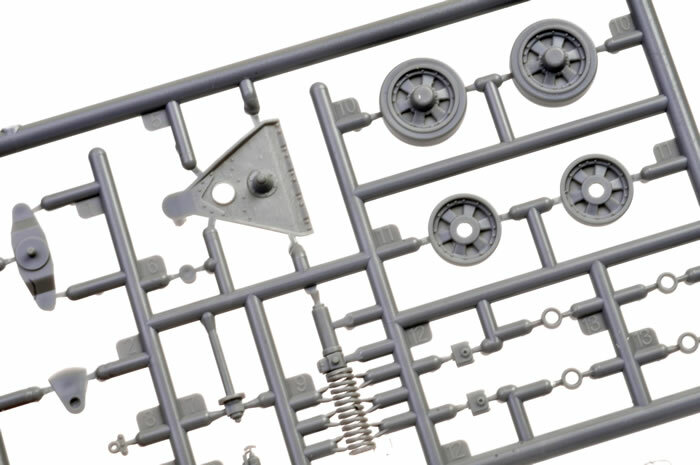 Recommendation: The Gecko kit is not perfect by any stretch and the overly complex nature of the track assembly comes to mind. In terms of detail however, it is superior to the Bronco kit in many of the smaller details. Both kits are fine out of the box but may well appeal to a different building demographic. If you want a quick build buy the Bronco kit. 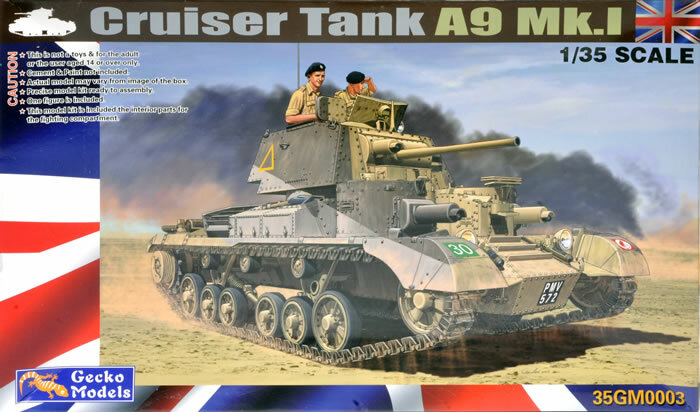 If you want a detailed build as I do then buy the Gecko kit. .
We certainly do live in the golden age of 1:35 scale modelling, don’t we? 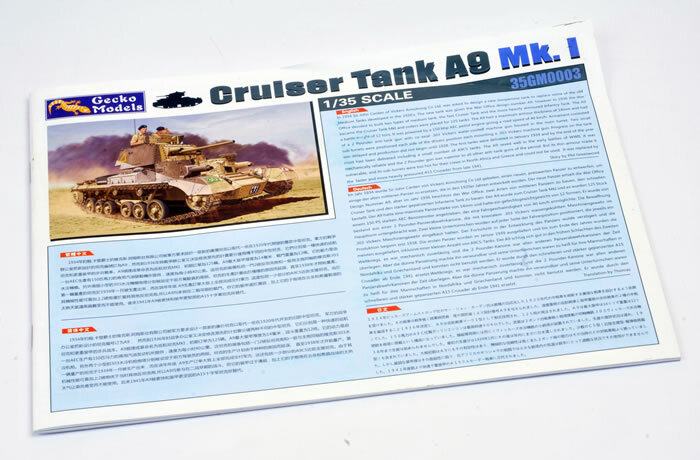 Who would have thought we would get another British Cruiser Tank A9 Mk.1? Gecko seems to have pushed the modelling envelope a little further yet again and produced a model that would have been unthinkable a few short years ago. The kit is presented in a largish box with a first class illustration adorning the box lid. 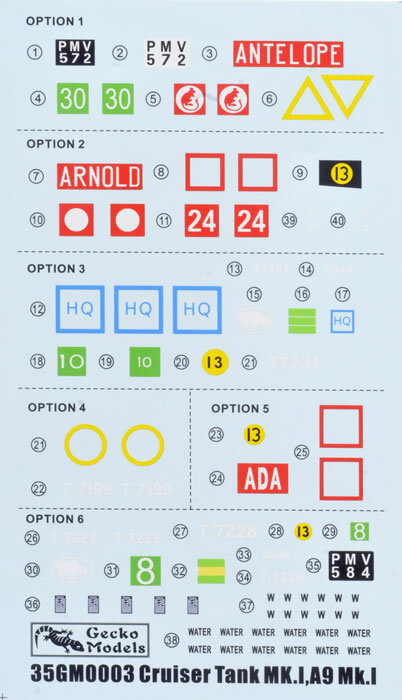 A well printed and precise 31-page instruction book (yes, it’s a book) is included with 38 construction sequences and 6 marking choices. 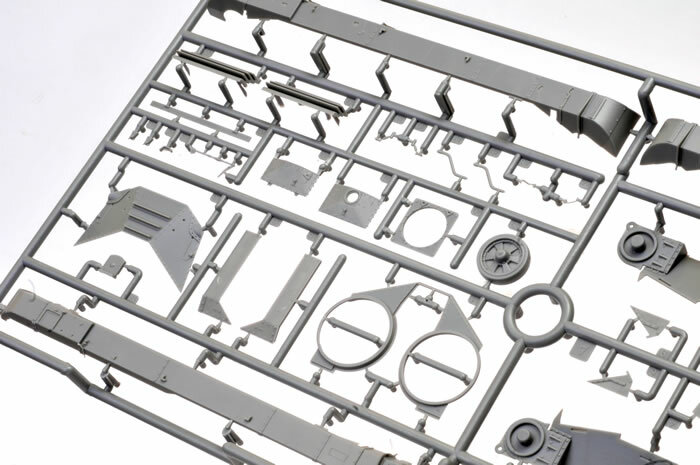 The instructions and the packaging have a quality feel to them and this perception is carried over to the plastic parts that make up the kit itself. 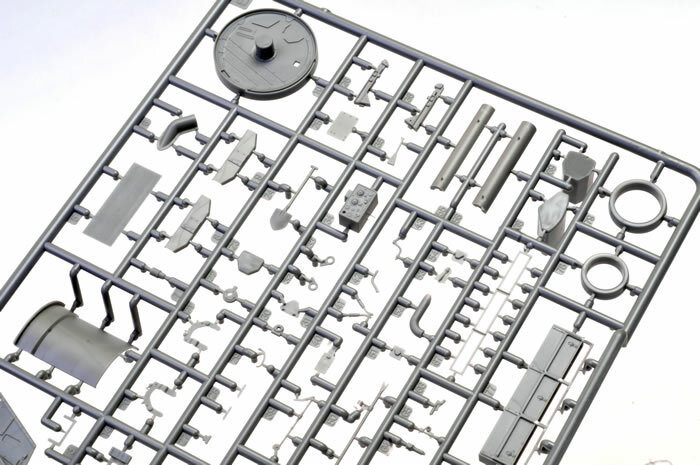 1,006 medium grey plastic parts are included across 39 sprues. 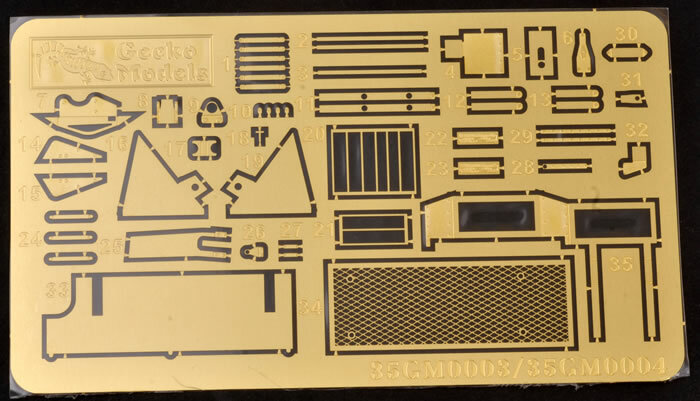 In addition to this, a 35 part photo-etched fret, one medium size decal sheet and a strand of wire is included. 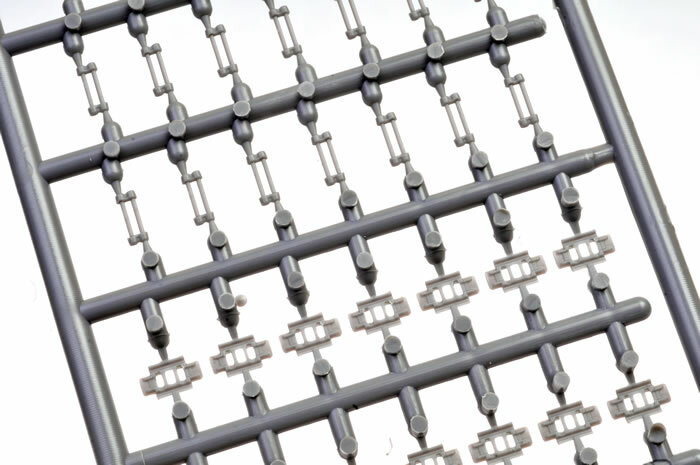 To be fair, the massive part count is largely made up of 588 parts (over 7 sprues) for the individual link tracks. 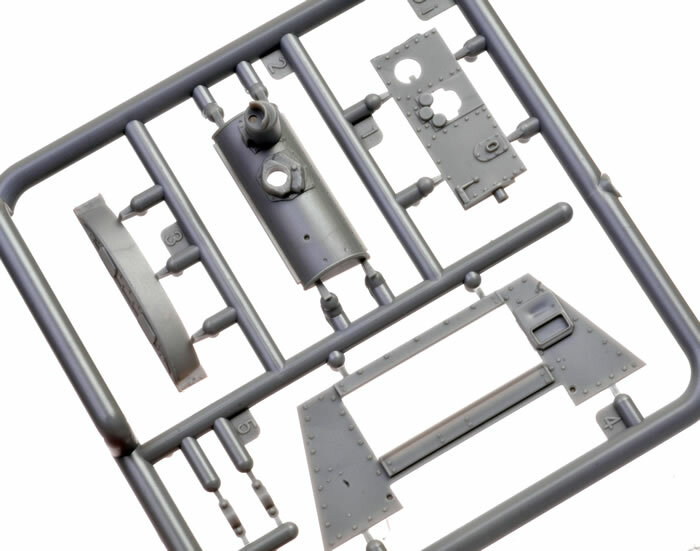 Comparisons between this and the Bronco kit are inevitable as are the different design and assembly approaches. 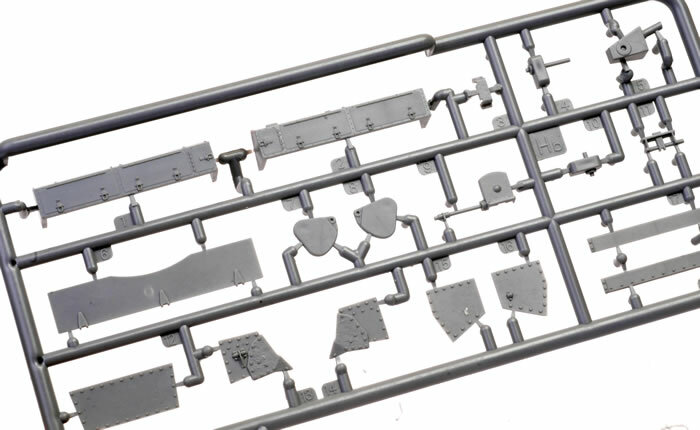 For instance, the Gecko kit tackles the tracks by the inclusion of multiple part individual tracks. 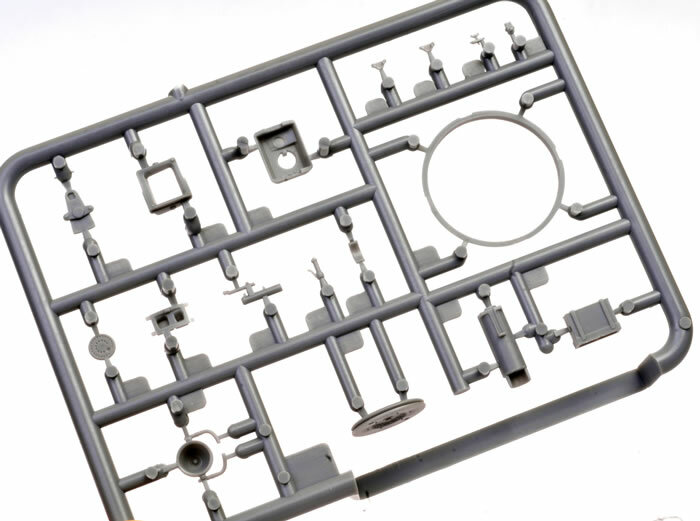 The Bronco kit does the same thing with the link and length, which is by far easier to put together. The Gecko approach is more accurate in terms of shape, particularly on the guide horn inner profile, but it comes at a cost. The tracks themselves are very fiddly and require a fair degree of clean-up. The best way to assemble these is to glue the upper and lower track pads together and let dry. 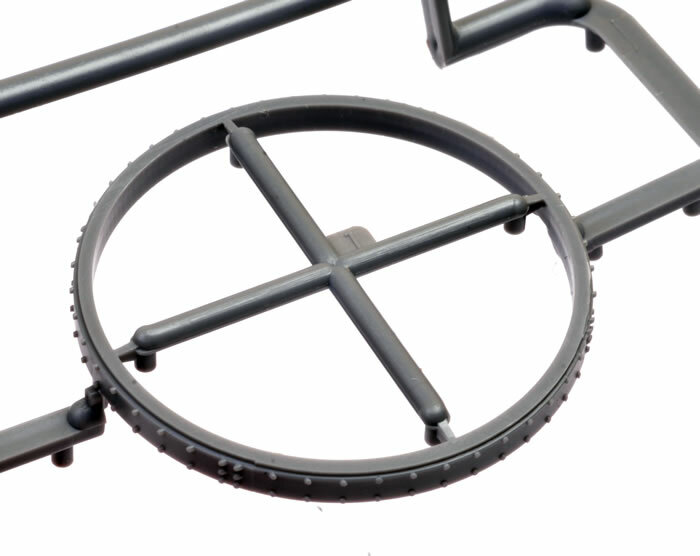 The end connectors of the track pin part can then be removed and two pad assemblies slid onto the pin part. The previously removed end connector than then be carefully glued on to where it was removed. 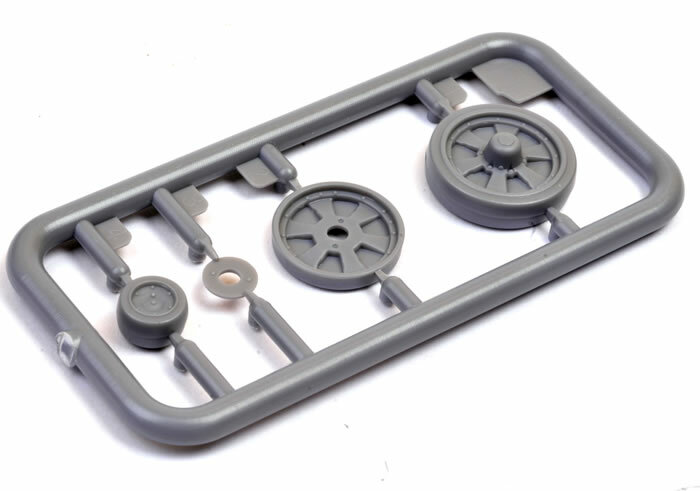 The lower hull tub is another example; the Bronco kit is supplied as a one-piece molding where the Gecko kit addresses this area as a six-piece flat pack assembly. The sheer detail on this kit is breathtaking. 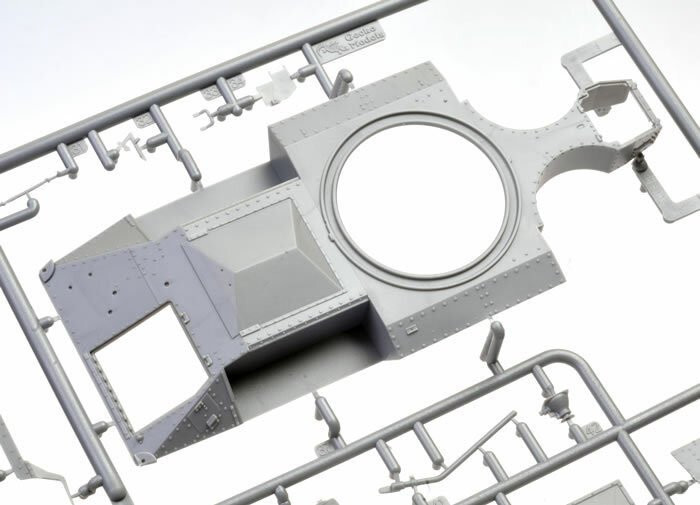 The upper hull has both domed rivets and screws on the rear deck, and is covered in all the smaller fine detail that the Bronco kit lacks. The road wheels and suspension are another example. 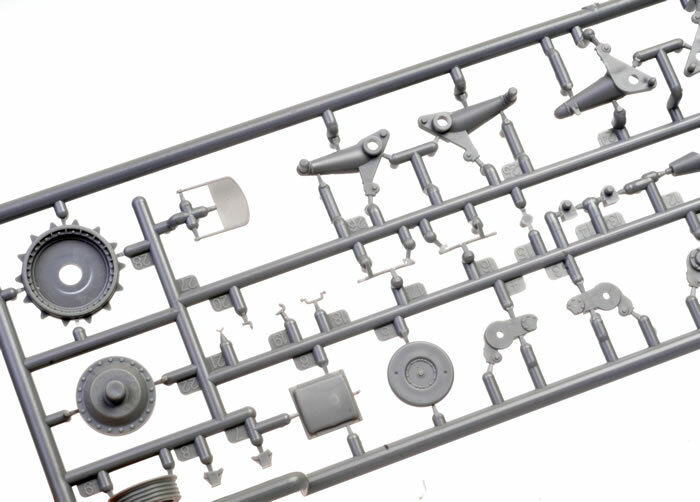 The Gecko kit exhibits much finer detail in terms of shape and definition of the smaller details with bogie springs in particular being provided as two parts as opposed to Broncos one. The Gecko approach gives the springs a see through look that is far more aesthetically pleasing to the eye. 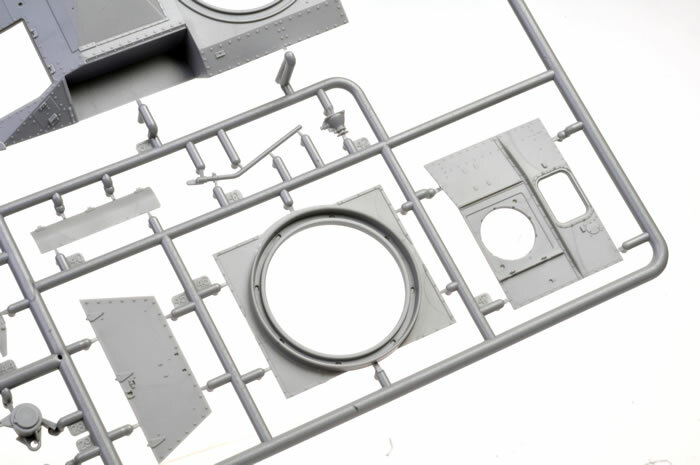 The Gecko kit also provides a semi complete interior with only the engine and transmission missing. 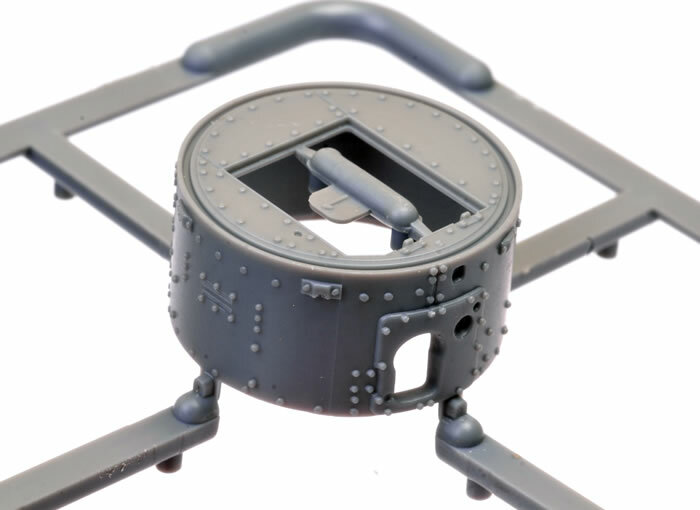 The two small hull turrets are pretty much complete both internally and externally and exhibit very fine detail on all surfaces. A nicely posed and detailed Commander figure is included that would complement any of the desert marking choices provided. A three-tone Caunter scheme “Antelope” from the 1st Armoured Division stationed in Libya 1940. An overall Portland Some example from the 7th Armored Division stationed in Egypt in 1940. A two-tone (of Khaki Green and Dark green) example from the 5th Royal Tank Regiment 1STArmourded Division stationed in the France in 1940. A three-tone “Caunter” scheme from the 1st Royal Tank Regiment stationed within the Tobruk Garrison 1941. An overall Portland Sone example from the 1st Royal tank regiment 7th Armored Division stationed in Egypt in 1940. A two-tone (of Khaki Green and Dark Green) example from the 2nd Royal Tank Regiment 1st Armourded Division stationed in the France in 1940. Decals are in register and colours look good. 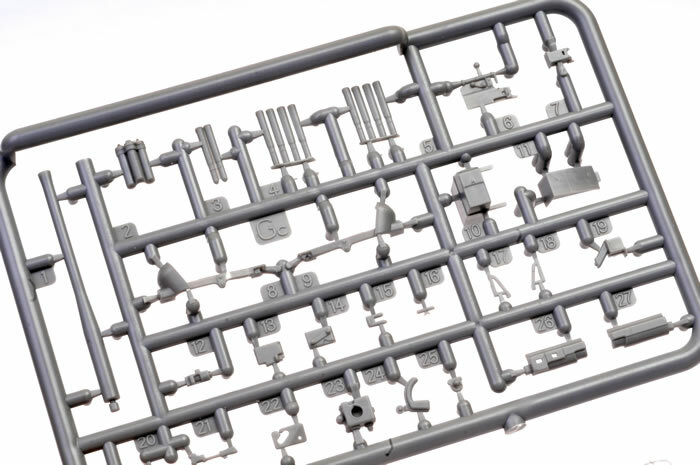 The Gecko kit is not perfect by any stretch and the overly complex nature of the track assembly comes to mind. In terms of detail however, it is superior to the Bronco kit in many of the smaller details. Both kits are fine out of the box but may well appeal to a different building demographic. If you want a quick build buy the Bronco kit. If you want a detailed build as I do then buy the Gecko kit.